SUPERIOR DURABILITY: One piece construction; handle won't loosen, no seams to hide food. Will not rust, warp, dent, or bend. TOTALLY NON-POROUS: Won't stain, retain odors or flavors. Won't leach chemicals into food. Meals remain pure and clean. RETAINS HEAT: Food stays warmer longer, great for serving. Use lower temps on stove and in oven. THERMAL-SHOCK RESISTANT: Take it straight from the freezer to the stove, then directly to the sink. FUNCTIONALLY TRANSPARENT: See what's cooking on the stove or in the oven. Great for cold storage of leftovers. DISHWASHER SAFE: Easy, no fuss clean-up. Won't etch or haze due to detergents. REMARKABLY VERSATILE: every piece of Visions is safe for stovetop, oven, broiler, microwave, and freezer / fridge. Visions is a brand of innovative glass-ceramic cookware originally created by Corning France. Aside from being notable for its transparent appearance, it is one of the few cookware lines than can be used on the range (gas and electric), in the oven (conventional, convection, and microwave), and under a broiler. It's also great for combination cooking. One piece of Visions can do the work that would typically require numerous pieces of more conventional kitchenware. It's also completely freezer and dishwasher safe. Finally, it is a very healthy choice due to it's non-porous nature. Visions will never stain, harbor odors, or leach anything into your meals. 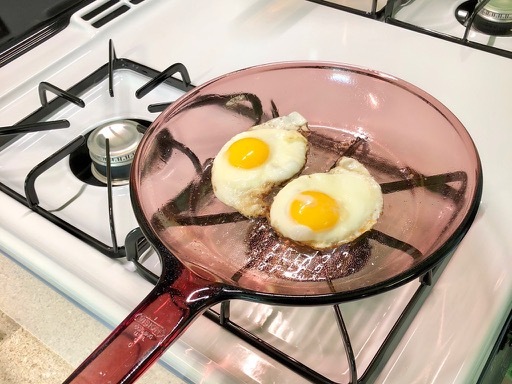 Released in Europe during the late 1970s and early '80s, it was officially introduced in the United States during the latter-half of 1983 and became the number one selling cookware set for a number of years. It is commonly seen in an amber or cranberry tint. A white variant was sold in some regions as "White Visions" and "Pyromax". Some model lines feature painted decoration, sculptured bodies, and SilverStone non-stick coating. Visions cookware is made of a transparent, beta-quartz material (called Calexium in some regions) belonging to the Pyroceram family of glass-ceramics. This material and a method of making it was first referenced in a patent filed by S. Donald Stookey, of the Corning Research and Development Division, in 1958. It was described as being a semi-crystalline ceramic having unique and useful properties such as coefficient of thermal expansion so low as to be negative in character, a true porosity of zero, and the unusual characteristic of being transparent despite a substantial crystal content (often greater than 75% by volume). In a further patent, filed in 1976, Kenneth Chyung described it as an ideal material for cookware and kitchen materials and "unquestionably better" in the areas of infra-red transmittance, stain resistance, and chemical durability than two existing Pyroceramic glasses used for Corning Ware and "The Counter That Cooks". The proprietary ingredients are mixed and heated to form a special kind of glass melt. The desired shape of the cooking vessel, such as a casserole or saucepan, is then molded from this melted glass mixture. Once formed, the vessel is repeatedly exposed to extreme temperatures and cooled under controlled conditions. This heat treatment makes crystals grow within the glass, turning it into a ceramic and dramatically improving the strength and thermal resistance of the final product. Plus additional oxides and colorants depending on the product line being produced. The ingredients above are mixed and heated to form a glass melt. The desired shape of the cooking vessel, such as a casserole or saucepan, is then molded from this melted glass. Once formed, the vessel is repeatedly exposed to extreme temperatures and cooled under controlled conditions. This heat treatment makes crystals grow within the glass, turning it into a ceramic and dramatically improving the strength and thermal resistance of the final product. A variant called "White Vision" is made out of an opaque, beta-spodumene version of Pyroceram. This is the same type of glass-ceramic as used for Corning Ware. In fact; Visions and Corning Ware can be, and often have been, made from the same glass melt on the same production line. The temperatures the vessel is exposed to during treatment dictate whether the final ceramic material is transparent or opaque. A number of patents have covered various methods for doing so and this is one reason why you will see various molds shared between these brands. Thanks to this process, VISIONS not only shares characteristics similar to Corning Ware but also has an improved resistance to staining and the detrimental effects of acids and detergents as an added benefit. It will withstand heat up to 850°C (1,560+ °F) and, due to it's ability to survive a temperature differential well beyond those experienced in a typical kitchen environment, a piece used for food storage in the freezer can be taken directly to stove and then table or sink without worry of shattering. Since the material is completely non-porous, VISIONS will never absorb food, or odors, or leach anything back into your meals. Additionally, Calexium is not prone to haze or etching typically experienced with ordinary glass kitchenware so is unharmed by the dishwasher. In 1953 S. Donald Stookey of the Corning Research and Development Division accidentally discovered Pyroceram, an opaque-white glass-ceramic material with a high thermal shock resistance. Included in his subsequent patents were references to a transparent variation of this material, as well. 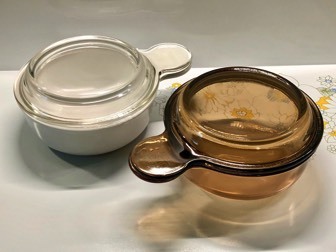 While Pyroceram would quickly go on to be used for a variety of products, most famously for Corning Ware cookware in 1958, the transparent version (later to be known as Calexium in some regions) was heavily studied over the next two decades. In 1963 George Beall, working under Stookey, explored a method for making transparent cookware. However, by 1966 Corning decided against commercializing it for fear that it would cannibalize Pyrex sales. 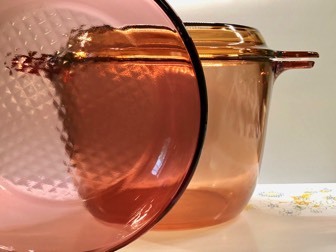 In 1977, Andre Andrieu and Serge Renault working for Corning France, patented the claim that would form the basis for amber-tinted, transparent "Vision" cookware. It was produced in France and released for the European market in 1979 to instant success. In 1981, Corning Glass Works began test marketing the cookware in the United States as an imported product under the name “Le CLAIR” rather than VISION due to a trademark conflict over the name. Once the trademark obstacles were overcome, the product finally received an official rollout in the second half of 1983 under the name “VISIONS”. Sales spiked during the mid-1980s when Corning released a series of television commercials showing a traditional piece of metal cookware being melted inside a transparent Visions pot, touting the product line as withstanding heat that will "turn ordinary sauce pans into sauce." It would become the number one selling cookware set for the next several years. Due to increased demand, Corning opened additional production lines in the US and Brazil. During the late 1980s and early 1990s, additional Visions products lines were offered including a decorated "Visions Deco" in 1988, "Sculptured Visions" for high-end dept stores and "Oven/Microwave Visions" in 1989, and "Healthy Basics" range in the mid-1990's that included the popular Versa-Pots. Additional colors were also produced; "White Vision" was released in the UK circa 1988 using opaque Pyroceram (as normally seen under the "Corning Ware" brand). This was also sold in Corning-owned retail outlets in the US, apparently, and sometimes under the name "Pyromax". "Cranberry Visions" was introduced in 1992 and remained on the market until the early 2000's. In early 1998, "Corning Consumer Products Company" (the consumer subsidiary of Corning, Inc. responsible for Corelle, Corning Ware, Pyrex, Revere, Visions, etc) was spun off, as the parent company refocused on the more profitable industrial business, and then renamed "World Kitchen" in 2000. This deal covered the entire consumer organization with the majority of its offices, factories, employees, and assets related to all brands. The company was renamed yet again, in February 2018, to Corelle Brands. Visions was temporarily unavailable in the United States from 2004 until 2006, after the US plant closed, but the product has continuously been made in France for nearly 40 years. In the USA, VISIONS is currently sold via "CorningWare, Corelle, & More" outlet stores and Corelle Brands websites. Visions has also remained popular overseas, particularly in the Asia-Pacific region where even more custom product lines have been created specifically for that market. -Doesn't everything stick to Visions? No. :-) VISIONS may require a small learning curve for some users, however, most of the reports of burning or sticking are down to two mistakes; using higher heat than required and/or not using the correct oil for the task. Keep your heat at medium or lower, unless boiling water. Also, a cooking spray like Pam will make even the VISIONS skillets almost idiot proof. See the Usage page for more tips. If things are still sticking, mineral deposits could be the culprit. See the section on the Care page for removing them. -I've heard Visions can shatter. Is it true? While it's true that all glass-based cookware can break if misused, VISIONS has been produced and sold for around four decades without recall or issue. In researching most incidents, it's found that the shattered item is NOT VISIONS but rather an ordinary glass bakeware product like Pyrex. Of the occasional, legitimate cases that actually involve VISIONS it's typically the result of user error; physical trauma (such as knocking metal utensils against the rim or banging the cooking vessel against a stone counter or cast iron sink) or continuing to use a piece that has already been damaged. Be extremely skeptical of anecdotal reports that claim Visions explodes without reason - as this professional analysis showed, that is not the case. Don't use VISIONS that has major chips, cracks, or deep scratches. -Isn't Visions just a style of Pyrex? It is not. Pyrex is made of ordinary glass, typically either borosilicate or soda lime glass to be exact. Because of this, Pyrex is highly susceptible to "thermal shock" during sudden temperature changes. On the other hand, VISIONS is made of a glass-ceramic that will withstand temperature extremes beyond those normally seen in a typical kitchen environment. It's important not to confuse them. Glass lids for VISIONS are often made of Pyrex, however, since it's inexpensive and easy to mold (and is often used for Corning Ware and Corelle lids, a well). -Is vintage Visions cookware made with lead? No. The glass-ceramic material used to create VISIONS does not include lead or similar harmful metals, as a primary constituent. Visions cookware will also test negative for cadmium, mercury, arsenic, etc. The FDA began enforcing limits on leachable lead in 1971. This is over a decade before VISIONS was officially released in the USA. Additionally, the California law known as Proposition 65, dedicated to eliminating exposure to toxic chemicals in consumer products, was passed in 1986. VISIONS has been produced under strict guidelines since introduction. …and VISIONS is non-reactive to typical acids and detergents, unlike most ordinary cookware. It's a non-toxic and very safe choice. -Can you help identify a piece of Visions? I'd be happy to help, and you're free to click the "Contact Me" link at the bottom of the page. Send me a couple clear pictures of what you have and any marks on it. You might get an even quicker response by posting in the Facebook group. -How much is my Visions worth? Value can vary widely from piece to piece, and also based on location. Your best bet it to check SOLD prices on eBay, or similar sales sites, in your region.